Me neither, until Harpers 360 suggested this was a must read. A little research led to the reasons this novel published eleven years ago had a less than stellar start in the United States. Irish Author, Derek Landy, initially landed a three book deal for the series and they were released both in the UK and the US. On this side of the Atlantic, the books received praise but little interest from readers (Just guessing, it might have been the original creepy cover with a skeleton and the ball of fire in his hand. A bit much to give as a gift to your favorite young reader). The series was quietly retired here. But guess what? The books became wildly popular in the UK, garnering awards and additional books in the series. No less than number twelve in the series will be released in June, 2019! Harpers 360 made an excellent decision to try this series again in the U.S. It began with the re-release of the first three books last May, books four, five, and six last month, seven, eight, and nine in January 2019, and finally ten through twelve in June, 2019. I didn’t dare start in the middle of this epic magical series and instead began with volume one pictured here. Same story, and thankfully a different cover, focusing on Stephanie, the spunky protagonist. You don’t even know the shadowy figure in the background is the rather endearing skeleton known as Skulduggery. The action comes in large doses as a fantasy world right before us is revealed. Stephanie makes the unlikely sidekick to Skulduggery (or vice-versa), though she soon learns why they’ve been thrown together. It’s fast, creepy at times, but what story telling! It will have you on the edge of your seat. If you enjoy a fast paced adventure with some often humorous dialog look no further. I recommend it highly. Even if you aren’t ready for the entire series, the first book wraps up nicely and hints at what is ahead. Even those who don’t like to read might get hooked and that alone is gold. Skulduggery is not a character I expected to like, but his sense of humor and plot dropping hints had me hooked. He foretells what is ahead with lines like “Doors are for people with no imagination.” He’s a walking, talking, good guy skeleton. No typecasting here. Stephanie is full of brave thoughts and actions. She is just the type of heroine both girls and boys will enjoy. The dialog among the characters is a fast volley that will have you smiling and rereading many of the exchanges. What fun the author must have had creating the other character names. China Sorrows, Ghastly Bespoke, and Tanith Low were my favorites. She turned. When his hat came off, his hair had come off too. In the confusion all she had seen was a chalk-white scalp, so she turned expecting to see a bald albino maybe. But no. With his sunglasses gone and his scarf hanging down, there was no denying the fact he had no flesh, he had no skin, he had no eyes and he had no face. 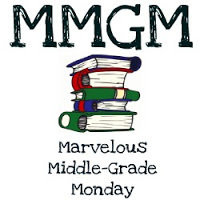 This entry was posted in Middle Grade Book Reviews, Reviews and tagged Derek Landy, female protagonists, Marvelous Middle Grade Monday, MG Magical Fantasy, Skulduggery Pleasant. Bookmark the permalink. I’m glad to hear you enjoyed this book! I loved it as well. Fits perfectly with the spooky theme of October. Great review! I read it too. Didn’t realize that there were so many other books in the series too. Glad you enjoyed it and great pick for this month. Hi, Greg ~ I enjoyed your post very much, especially the facts about how this series has been brought back to life. I really love the colors and silhouettes on the book cover. Thanks so much for posting this for MMGM! Yes, I’ve read this book, although it was so long ago, it was an arc! (Advantage of working in a bookstore back then).I didn’t remember much about it except the wisecracking skeleton, but I’m happy to see the new cover gives Stephanie more importance. I never read the sequels, because I’m not a huge fan of horror, although funny horror can sometimes win me over. Ooh! This series looks really interesting,especially this time of year! Thank you for introducing it to us. I have never heard of this book or series, but the title does grab you. I’m glad Stephanie has a new cover, which is mysterious and appealing. It sounds like an excellent read, perfect for this time of year! “She’s twelve. He’s dead. But together they’re going to save the world.” You got me. I will have to check these out. Thanks for the post.